As we await the arrival of an ever superior generation of calves over the coming months, it is now worthwhile to take a closer look at young calf nutrition when planning ahead for the busy season. Members of the Agritech team recently attended a Calf Performance Conference at the Blanca Research Facility in Spain which featured presentations from many renowned researchers, including Professor Alex Bach. According to Agritech’s Sales Director, John Kenny, “From the conference, it became clear to me that at a level, we are significantly restricting the potential of our calves in this country with the level of milk replacer we feed to them. While this is fine for young calves which are destined for beef, it is totally uneconomical to take this approach with dairy female calves. Farmers today are very well informed when it comes to the area of managing and feeding adequate amounts of colostrum to the new born calf in a timely manner. However, the benefits of achieving maximised weight performance from day two to weaning are far less documented in Ireland. Let’s take an example of the calf’s mammary gland. When a dairy heifer calf is born, its mammary gland constitutes just 1% of its total body weight. If the daily live-weight gain of this calf is inadequate up to weaning, this key organ will most likely remain at this percentage. However, if calf performance is raised up to as near as possible to 1kg per head per day, the cells in this key gland will continuously split and multiply to the extent where the mammary gland will increase to approximately 2% of the calf’s body weight at 9-10 weeks of age. While the above example highlights the mammary gland, the benefits of accelerated growth pre-weaning are applicable to all of the key organs in the young calf’s body, including heart, lungs, kidneys etc. The long term benefits of achieving a better developed calf at weaning with bigger and stronger organs are proven to deliver significant lifetime benefits through increased daily yields and improved disease immunity. It is also now widely accepted that the effects of increased growth pre-weaning on first lactation alone is circa +300 litres milk yield. Agritech work with leaders in calf nutrition to bring a calf milk replacer range which will encourage accelerated growth and performance. Agritech’s Vitalac Calf Milk Replacer Range from Nukamel offers a well-balanced level of highly digestible fat and protein via carefully selected, high quality ingredients. These quality ingredients are further enhanced through the use of advanced techniques and technology such as Emulsizym an d Spray Cooling Technology. Tried and tested by Teagasc at Grange Research Institute, Vitalac Milk Replacers for calves showed increases in live weight gain and concentrate intakes of 8% and 10% over other leading brands on the market. 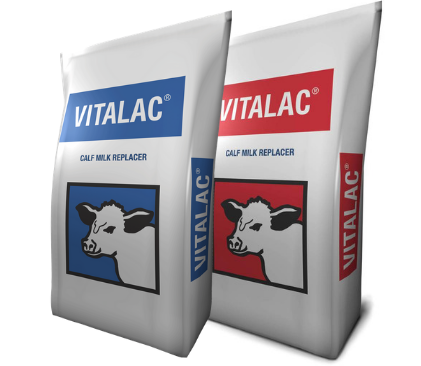 Vitalac Calf Milk Replacer is highly soluble and suitable for both bucket and/or automatic feeding systems. For more information on the Vitalac Calf Milk Replacer Range and calf rearing, contact your local distributor or click here.